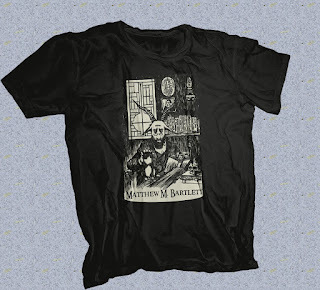 Matthew M. Bartlett: Matthew M. Bartlett t-shirt available now. There is now a t-shirt of...well, me. And Larry. Hi, I'm interested to purchasing the Matthew M. Barlett t-shirt, but I'm seeing the buying link broken. Can you help me with this? As of right now, the shirt-maker is not actively printing/selling. This may change in the near future. In the meantime, I have two shirts available, an XL and a medium. Please let me know if you'd like to buy either of them.